9 November 2017: Leading researchers at the University of Canberra have been singled out for recognition at the annual Awards for Research and Innovation Excellence. The awards recognise the accomplishments of individuals and groups across all parts of the University whose research and innovation achievements have been particularly significant. Deputy Vice-Chancellor (Research and Innovation) Professor Frances Shannon said the recipients are drawn from three broad disciplines: social sciences; humanities and creative arts; and science, health and technology. “Each of the winners receives prize money which can be used over the next year to support research-related activities such as travel, equipment purchases or conference attendance. The Centre for Creative and Cultural Research's Creativity and Social Change group received the Vice-Chancellor’s Award for Outstanding Achievement in Research or Innovation. (L to R) Scott Brook, Ross Gibson, Paul Hetherington, Jen Webb, Jennifer Crawford, Jordan Williams, Ian Drayton and DVC R&I Professor Frances Shannon. Photo: Marcus Butler. “The winners in each of the categories also receive a nomination to the Vice-Chancellor’s Researcher of the Year awards, later in 2017. The Research Excellence Award recognises the accomplishments of individuals whose research achievements have been outstanding over the last three years. Apart from publications, non-traditional outputs, research income, and HDR student supervision, this includes the research leadership and entrepreneurial spirit they have displayed. Winner - Centenary Professor John Dryzek. 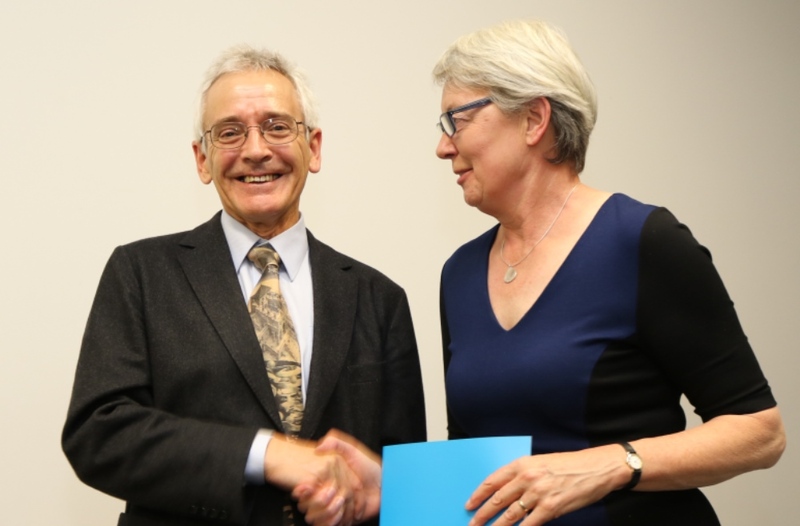 Centenary Professor John Dryzek is a member of the Institute for Governance and Policy Analysis and the holder of an ARC Laureate Fellowship – the most prestigious award of its kind that is bestowed on individuals who are truly global leaders in their field. Professor Dryzek is a world-leading political scientist, with a particular interest in deliberative democracy. As part of his Laureate Fellowship, he is investigating the various forms that deliberative practice can take and the conditions under which it can flourish. Commendation – Centenary Professor Deborah Lupton. Winner – Professor Paul Hetherington. Professor of Writing in the Faculty of Arts and Design Paul Hetherington was recognised not just for his traditional academic accomplishments, but also his work as an accomplished poet, who has published 11 full-length collections of poetry. He has won numerous prizes for his work, including the 2014 Western Australia’s Book Award - poetry for his collection, Six Different Windows. Joint winners – Professor Rachel Davey and Professor Roland Goecke. Professor of Health Research Rachel Davey is also the Director of the University's Health Research Institute. Along with this demanding leadership position, she maintains a high level of productivity in research, which focuses on areas related to physical activity for the prevention of non-communicable diseases. Over the past few years Professor Davey has been the recipient of more than one million dollars in funding and produced more than 50 highly cited publications. Professor of Computing and Technology in the Faculty of Education, Science, Technology and Mathematics (ESTEM), Roland Goecke's research interests are in affective computing and computational behaviour analysis. These fields have important applications in mental health research. He is particularly commended for his outstanding research achievements against the backdrop of a full teaching load and management role, having held the role of Assistant Dean of Research within ESTEM for the past few years. Commendation – Associate Professor Dianne Gleeson. The Deputy Vice-Chancellor’s Award for Early Career Researchers recognises individuals who have shown outstanding performance in research relative to opportunity over the past three years. Winner – Assistant Professor Philip Roberts. Assistant Professor in Curriculum Studies in the Faculty of ESTEM, Philip Roberts receives this award for his research which focuses on place, the sustainability of rural communities and the interests of the less powerful in our society. In the short time since the completion of his PhD, Dr Roberts has distinguished himself in various ways. This includes being awarded various prizes such as the best dissertation award 2016 of the American Education Research Association, the world’s largest association of education researchers, and being the recipient of funding from bodies such as the Department of Education and the Murray Darling Basin Authority. Winner – Assistant Professor Caroline Fisher. Assistant Professor of journalism in the Faculty of Arts and Design, Caroline Fisher receives this award for her research into topics including trust in news media, disclosure and transparency in journalism, and new platforms of media utilised by politicians. Apart from traditional academic outputs, Dr Fisher uses the media itself to widely disseminate her views to the public. Winner - Assistant Professor Richard Keegan. Assistant Professor of Sports Psychology in the Research Institute for Sport and Exercise, Dr Keegan works in the area of motivational processes in sport and exercise, physical literacy and psychological resilience. In the space of three short years he has attracted almost $300,000 in funding and produced high impact outputs that are very highly cited. Commendations - Assistant Professor Ben Kefford and Assistant Professor Kumudu Munasinghe. Sixteen nominations were received for the Award for Excellence in Supervision of Higher Degree by Research (HDR) Students which is nominated by HDR students. Associate Professor of Creative and Cultural Practice, Tony Eaton has distinguished himself through his highly effective and innovative supervisory practices that enable students to develop the skills needed to be successful researchers, to manage the timely completion of milestones, and ultimately excel in their work. Dr Eaton is a man of great patience and empathy who is able to understand difficulties students encounter from time to time, and to work with them to ensure they succeed. Commendations – Assistant Professor Naomi Dale, Professor Deborah Davis, Associate Professor Fiona Dyer, Distinguished Professor Arthur Georges, and Professor Ross Thompson. This award is for a researcher who has shown distinction in impact and engagement, as evidenced by excellence in the conduct of high impact research and commitment to seeing its translation to positive outcomes for beneficiaries. This is an area where we have seen significant growth at the University over the past few years, and 10 staff were shortlisted for this award. Associate Professor Jacki Schirmer is engaged in a large suite of projects across a number of fields which will lead to tremendous benefits for the wider community and, to achieve the positive outcomes she has already produced, Dr Schirmer engages directly with policy and program developers, as well as end users. Her research interests focus on understanding the social dimensions of natural resource management, particularly how people's access to and use of natural resources affects their health and wellbeing. Dr Schirmer's work engages with numerous government organisations and peak industry bodies who value and respect her insights. COMMENDATIONS – Senior Research Fellow Fiona Dyer, Distinguished Professor Arthur Georges,and Research Engineer Braden McGrath. This award is for an individual or group who have achieved an outstanding accomplishment that has distinguished them and the University. WINNER – Creativity and Social Change, Centre for Creative and Cultural Research. 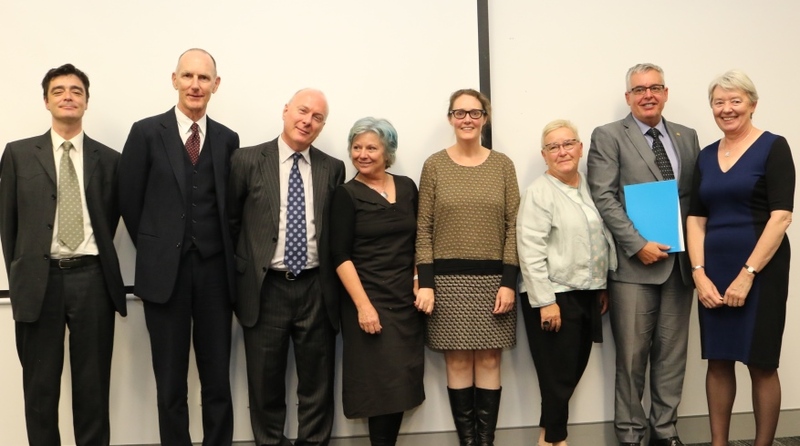 Ian Drayton, Centenary Professor Ross Gibson, Associate Professor Jordan Williams, Assistant Professor Jennifer Crawford, Professor Paul Hetherington, Professor Jen Webb, Associate Professor Scott Brook, and Postdoctoral Fellow Paul Munden. The CCCR has distinguished itself through its ability to conduct research into creative practice that has application to community building and resilience and wellbeing. Individuals in this team are well known for their outputs and have received numerous awards in recent years. The truly innovative nature of these individuals as a group is seen in their ability to realise the potential impact of their work, by working with organisations such as the Australian Defence Force in the treatment of Post-Traumatic Stress Disorder (PTSD). The impact of their work was recognised in this year’s pilot Engagement and Impact assessment exercise, where they received the highest possible rating. COMMENDATION – Somatosensnsory Performance Research Team, Research Institute for Sport and Exercise. Associate Professor Nick Ball, Ashleigh Marchant, Assistant Professor Jeremy Witchalls, and Professor Gordon Waddington. The UCRISE Somatosensnsory Performance Research Team is commended for their 'Astronaut Project'. This team, led by Gordon Waddington, is working with a world-leading scientific organisation – NASA – on a project focussed on the development of human deep-space flight, with the ultimate goal of enabling humans to travel to, and walk on Mars.